These printable worksheets can be used to help your students learn to count by 6s. Count 6, 12, 18, 24, 30, 36, 42, 48, 54 and so on. Count along the number line by 6s and write the missing numbers in the boxes. Practice skip counting by sixes with this printable activity. These penguins have multiples of six on their bellies. Skip count by 6s to complete the numbers. 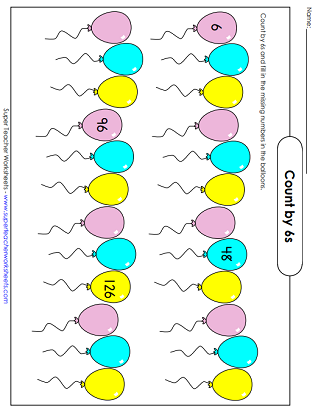 These balloon pictures have multiples of six on them Can you add the missing numbers? Skip count by 6s to fill in the missing numbers on the caterpillar. Count by 6s from 0 to 60. The finished picture is a star shooting through outer space. Skip count by six, then answer each of the word problems and math questions. 6, 12, 18, ...What's next? 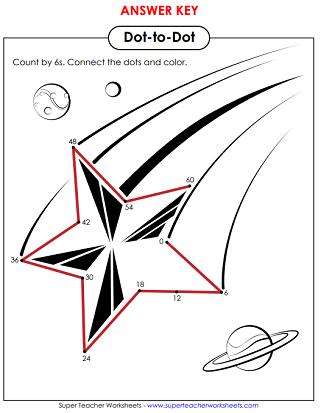 Count by 6s on this printable worksheet. Learn to basic multiplication facts with the worksheets on this page.